Happy University Day, UNC-Chapel Hill. October 12th has always been an important date for me for two reasons. 1. It's my older sister Rebecca's birthday. Happy Birthday! 2. It's also UNC's birthday - also known as University Day. Fun fact for those of you who didn't know... UNC-Chapel Hill is the nation's first public university. This date is quite the celebratory one, simply put. 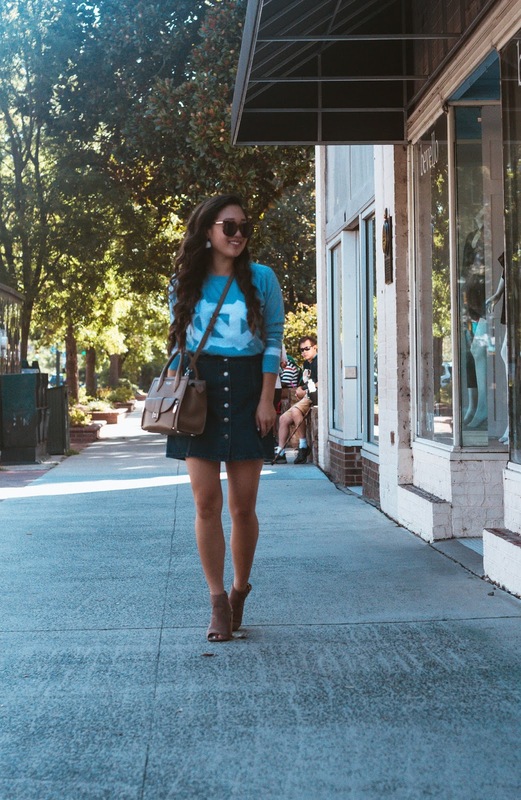 And even though I'm miles and miles (and miles) away from campus, I wanted to celebrate UNC's University Day with my own take on sweater weather dressing for the fall season. Sweater weather back in North Carolina isn't what you would expect. It's still in that stage where the weather is brisk in the mornings, but by afternoon, you're sweating on the walk home from classes. 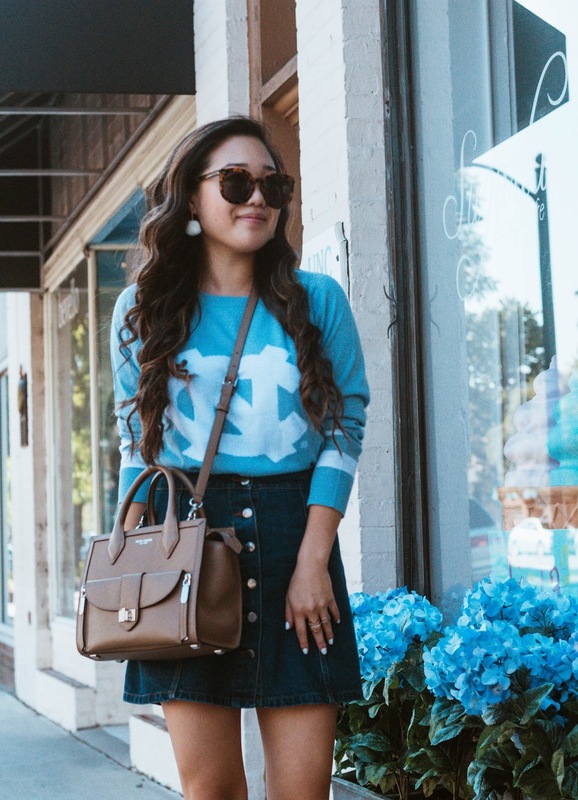 Style tip: style your UNC sweater with a denim skirt with either over-the-knee boots or a pair of booties. 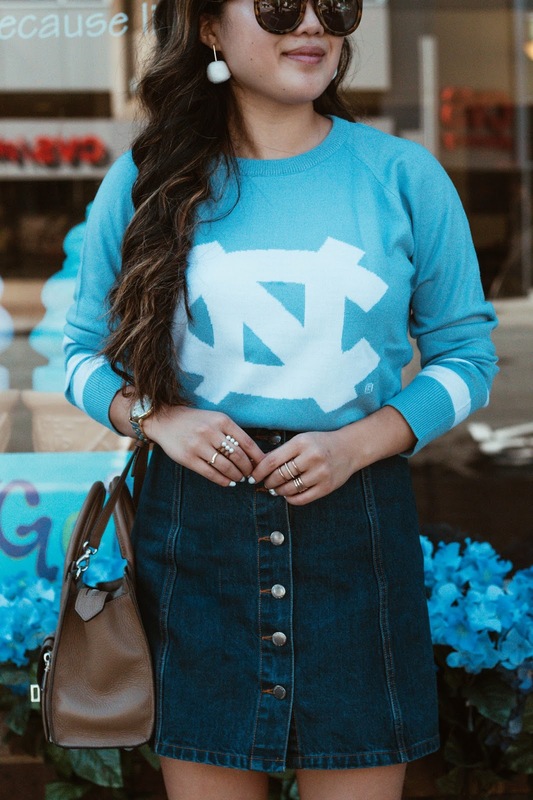 I'm always proud to rep anything Carolina no matter where I am, so you can bet I would've worn something like this on campus for University Day. For all my Tar Heels back on campus right now... have fun celebrating UNC's special day. 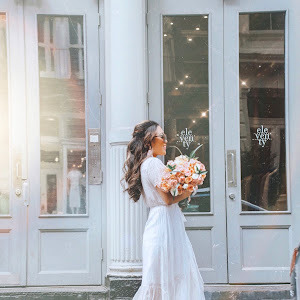 Emerson Street Clothing is graciously offering Gracefullee Made readers 20% OFF on all orders from October 12-30. Enter code: GoUNC at checkout!